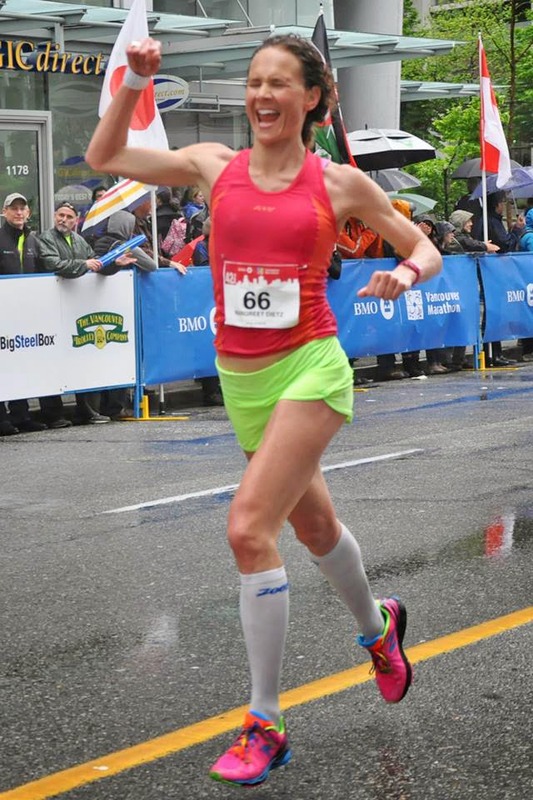 Three weeks have passed since I ran the 2014 Vancouver marathon; I have had time to reflect and analyze my race. As usual, this event was superbly organized and I recommend it, especially on the new (since 2012) course, which is more scenic and offers a flat final 10K (except for a minor incline in the final 500m to the finish). Most notably, I loved the cheering volunteers that lined Stanley Park this year. I was grateful to be able to start, grateful to feel confident enough to aim at improving my personal best of 3:00:29, which I ran on the same course in 2012. My body has bounced back from a one-year layoff with injury starting in June 2012 better than I'd expected. Not being able to run for such a long time has renewed my love for running and my appreciation for the ability to train and race again. Even so, the Vancouver marathon did not go as I had planned, hoped. It is hard to pinpoint a reason but I have a few theories. The analysis is done to help me learn from this marathon, my 18th, and improve in the next. It also helped me decide to race another, if all goes well, as early as June 1. 1. It was a wet day. 2. About 4K into the race, I was stopped to allow traffic to cross the course. I stopped my watch almost immediately and did not time my stop because it would ruin my ability to track my race time. 3. About 13K into the race, I felt I was running below goal pace and picked it up. 4. I passed halfway at 90:02 on my watch. 5. About 25K into the race, I felt flat, lacking energy, and it became a matter of slowing down as little as possible. 6. I made sure to celebrate my finish, regardless of my time. Re 1 the weather: since the conditions on race day are beyond a runner's control, I was determined to embrace whatever weather we were given. Perhaps that led me to ignore them completely, instead of adjusting my goals. Then again, the rain was not torrential (not that I can recall anyway) and the temperature was OK. I do not think the weather influenced my race much. Re 2 While I had read about the possibility of being stopped for traffic, I had not expected this to happen to the runners on 3-hour pace. By 4K I had just found my rhythm, and was stunned when I, and other runners near me, had to stop. I tried to stay calm, but I might have spent a little more energy than was wise when we got running again. Did I go too fast here? Re 3 After about 13K there was a short out-and-back section, and a timing mat. I remember thinking here that I was probably taking it too easy if I wanted to stick with my 2:59 goal, and that I needed to decide to commit to my goal now if I wanted to have a chance at achieving it. I might have sped up too much here. Re 4 When I was stopped just after 4K, I also stopped my watch. There were timing mats to adjust our race time. So I did not take a split of our wait time, as I wanted to keep track of my race time overall. The official results show that I crossed the halfway point at 90:22, and they tracked my time at the 4K stop at 13 seconds, which would put me at halfway at 90:09. My own watch showed me passing halfway at 90:02--I remember thinking at this stage, great, I am on track for 2:59. Re 5 But after about 25K my energy levels just sank. My body also felt stiff, particularly on the right side. Was it just a dip? Would I feel better in a few kilometres? Had I run too fast? Was I having an off-day? I focused on running as well as I felt I could, trying to slow down as little as possible. But I knew I was slowing. And could feel my Sub-3 goal slipping away. Re 6 As I ran to the finish line, I felt a surge of happiness. The clock ahead read 3:06-something. More than six minutes slower than two years ago. Seven minutes slower than my goal. But I was here finishing a marathon, when a year earlier I had still been unable to run, without any sign that I might return to training at all. So I celebrated. A 3:06 marathon is nothing to be disappointed about as an amateur runner. Heck, finishing a marathon at all is worth some fist-pumping.